Gurim Has Been Busy Having Fun!! In the last few days since you last checked in on us, aydat (unit) Gurim has celebrated the fourth of July (on July 6th), been in a parade, watched an amazing fireworks show, interpreted dreams, hung out with our Kerem (CITs), visited a state park, and had an all-around amazing time! On Monday, we finally got around to celebrating the birth of our nation. The afternoon was filled with a parade, costumes, dancing, and singing American songs. 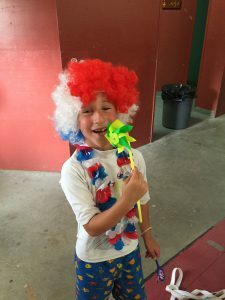 Later on, after an all-American dinner of fried chicken and mashed potatoes, the whole camp came together to watch the 4th of July talent show, an old masoret (tradition) at Yavneh. We even had a few acts from Gurim and we couldn’t be prouder! As the skies darkened to a pleasantly-clear navy, we turned our faces towards the heavens as the sounds of someone’s John Williams soundtrack bombarded our ears while the fireworks of liberty announced themselves to our eyes with explosions of sparkling reds, blues, and whites in every direction shining across the sky. After such a display, we were exhausted, to say the least, so we hopped into our beds eager to get enough sleep for the busy days ahead of us. Tuesday was a day of anticipation and spontaneity. The majority of it was spent wondering if it was going to rain and preparing accordingly for the rain. In the end, the rain wasn’t so bad, but we still had a ton of fun learning about our chesed (acts of loving kindness) project of making challah covers for the entire camp to use on Shabbat. In addition, we had a ping pong tournament and learned about nature and gardening with Chava, the teva (nature) lady.The afternoon culminated with our first Zimriyah (singing competition) rehearsal where we learned our entire shir Chasidi (song with Jewish text), Hashem Melech (God is king). LET’S JUST SAY, WE SOUNDED AMAZING. This is gonna be a good Zim for aydat Gurim. Trust us. After dinner on Tuesday, we had an peulat chinuchit (educational activity) about Joseph from the Torah and the way that he interpreted dreams. We then got to interpret real dreams that our madrichim (counselors) had had in the last week. It was super fun and creative, and the interpretations definitely got a little wacky. Wednesday was ACHLA YOM (trip day)!!!! 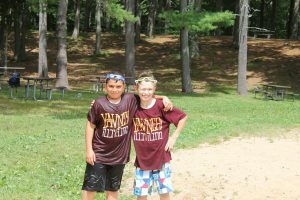 Originally, we were pretty convinced that we were going to a paper factory, but as it turns out, we were actually going Kingston State Park, a beautiful park with a beach, a lake, and picnic tables, and enough space for us to run, and jump, and play. 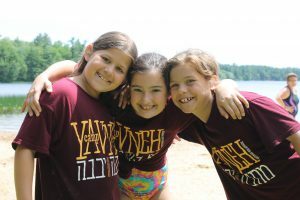 We swam around in the water with our chaverim (friends) and madrichim, and even built a dam in the sand so that we could control some of the water as it flowed through the sand and into the lake. It was a group project that kept us busy for hours.Towards the end of our fun time at the park, we learned the hand motions to our shir Chasidi, and we couldn’t be more excited to show the world our talent come Zim in a week. On Wednesday night, we made our own countries during a peulah called Make-a-Medina (state). We created our own flag, culture, bill of rights, anthem, and more, and then presented what we made to the entire aydah. It was awesome! !